The Ring Brothers consistently bring amazing cars to SEMA every year. Last year they showed off the 1970 Mustang “Dragon” and a 1966 Mustang race car, each of which impressed in their own way. For 2011 they have brought yet another Mustang, a 1965 Mustang Fastback nicknamed the “Producer”. The car certainly does produce – 740 horsepower from the 351/427 strocker V8 built by Keith Craft that uses and Edelbrock Super Victor 4 barrel intake, Holley 75 HP carbureator and a Crane cam, roller rockers and distributor. The car also features a Tremec T56 6-speed transmission, Baer brakes, Forgeline 3-piece 18-inch wheels and a fully custom interior with a chromoly roll cage. The exterior is perhaps the most impressive part of the car, with fenders widened four inches, custom orange BASF paint and a carbon fiber roof and hood. You can see a full list of features and a photo gallery of the Ring Brothers 1965 Mustang “Producer” below. 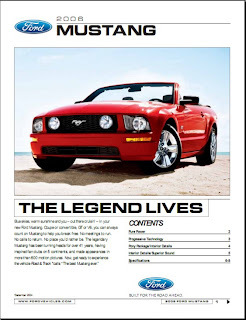 This entry was written by by MustangsDaily (Mustangs Daily) and posted here on Wednesday, November 2nd, 2011 at 5:35 pm and is filed under 1965 mustang, News, ring brothers, ring brothers 1965 mustang, ring brothers mustang, ring brothers producer mustang, royal purple, sema 2011. This article was not written by us, rather gathered using RSS feeds listed here. We take no credit for this article. You can leave a response, or trackback from your own site.